General: The primed surface must be clean and dry. Achieving maximum gloss and distinction of image requires the primer to be smooth sanded with 280-400 grit paper before topcoat application. Using a contrasting mist coat of lacquer primer as a "guide coat" is recommended. Smooth sanding until all of the "guide coat" is removed indicates a texture free surface. Typically three coats are recommended for spray applications. Spray applying certain colors may require 4 or more coats to obtain full hide (opacity) or color coverage. Brush/Roller applications require at least two coats. Spray application: Apply a light, smooth, slightly wet tack coat to the surface. Allow tack coat to "flash off" 15 to 45 minutes. Then apply the second coat as an almost full wet coat. Allow the second coat to "flash off" 30-45 minutes until only slightly tacky before applying a third coat. Coats two and three are not "full, wet" coats. The third coat should be just heavy enough to obtain full hide (opacity) or color coverage. Brush/Roller application: Apply Awlgrip Topcoat in at least two coats, allowing 16 hours between each coat. Sanding between coats with 320-400 grit paper will provide a smoother finish. On large surfaces such as hull sides, transoms, and house sides, first roll the Awlgrip Topcoat and then smooth the roller stipple by lightly tipping the surface with a brush. This can be done with 2 painters working side by side (i.e., 1 rolling and 1 tipping), or with 1 painter rolling approximately 6 square feet and then tipping that area before rolling any further. For best results AWLGRIP colors should be applied over properly prepared 545 Epoxy Primer, 345 HS Primer or in brush/roller applications Awlquik Primer. Awlgrip colors may also be applied over recently applied Awlgrip topcoats/showcoats – consult your local Technical Sales Representative for advice. Awlgrip High Gloss Clear G3005 can be applied over dark Awlgrip colors which have been sanded with 320-400 grit paper. Do not apply G3005 over white or pastel colors. Do not apply G3005 directly to bare wood. Spray: Mix by volume one part Awlgrip Topcoat Base Component with one part Awlcat #2/G3010 Spray Converter to a smooth, homogenous mixture. Reducer addition level required to achieve 14 seconds viscosity (DIN4 or equivalent) varies color to color. For standard conventional spray application this can be attained by adding up to 25% reducer using the correct spray reducer(s) appropriate for conditions. For example, if a 25% reduction is used, overall mix is 1:1:½ by volume (8 oz. Base, 8 oz. G3010, 4 oz. Reducer). Clear coats and painting in high temperature conditions may require additional reduction. Brush/Roller: Mix by volume two parts Awlgrip Topcoat Base Component with one part Awlcat #3/H3002 Brushing Converter until one smooth, homogenous mixture is obtained. Reduce 10-33% with T0031. Overall mix is 2:1:⅓-1 by volume (8 oz. Base, 4 oz. H3002, 1.3- 4 oz. T0031). It is difficult for dirt grime and grease to adhere to an Awlgrip, Awlcraft 2000 or Awlgrip HS Topcoat. However, over time, a build up of dirt, grease and other contaminants can cause the finish to appear dull. 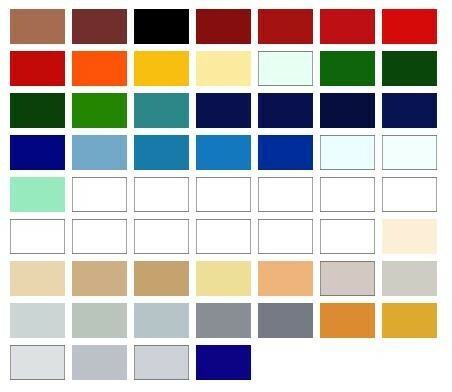 Maintain your topcoats with Awlwash/Awlcare - some tips on maintaining your boat's natural beauty. The mirror-­like gloss can be easily maintained by following these simple rules. 1. Wash the surface regularly with Awlwash 73234 and water. Regular cleaning will avoid build up which can slowly attack the topcoat, prematurely ageing the coating. 2. 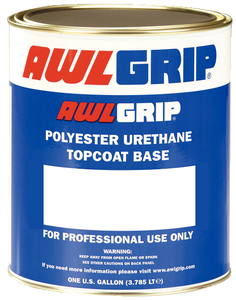 Awlgrip and Awlgrip HS only: Solvents such as Awlprep T0008, Awlprep Plus T0115, toluene, laquer thinner, M.E.K., acetone or kerosene may be used to soften or remove heavy build ups of grease and grime, felt tip markings or spray paint on the topcoat. Awlcraft 2000 only: Use only mild solvents to remove stubborn stains. Awlprep T0008, mineral spirits, xylene, kerosene and diesel fuel are acceptable for use on Awlcraft 2000. For Awlgrip, Awlcraft 2000 and Awlgrip HS: Apply solvents with soft clean cloths. Wipe up solvent quickly. Do not allow solvent to dry on the surface or puddle and soak into the surface. Wash these areas with mild detergent and water to remove solvent residue. 3. Always thoroughly rinse all surfaces with fresh water after cleaning with detergents or solvents. Latent solvent residue can attack the topcoat, while detergent residue will attract dirt. 4. Use distilled white vinegar and hot water to remove stubborn salt stains. 5. Use Awlcare 73240 by hand only to remove stubborn diesel soot stains. General: Wax build up ages and yellows very rapidly, creating the need to maintain the wax and causing the topcoat to appear yellow. Wax build up also collects dirt, increasing maintenance. Awlgrip Only: Waxing with a wax which contains no abrasives or cleaners will probably not hurt the surface, but at the same time offers no benefit. Regular waxing will not increase the life of an Awlgrip Finish. Wax can temporarily restore the gloss to small scuffs, scrapes, scratches. Sometimes allowing the postponement of repairs or repairing until a convenient time. Awlcraft 2000 Only: Waxing will help maintain the gloss on Awlcraft 2000 finishes, especially those which have been buffed or polished. Remember waxing leads to having to maintain the wax. Do not wax areas unless they are dull or hazed. 2. Do not use abrasives, scratch pads or polishing compounds. Scratching the surface gives dirt a place to cling while wearing out the resin layer. Using abrasives of any kind will reduce the overall life of the finish and voids the Awlgrip Limited Warranty. 3. Do not allow contact between the Awlgrip, Awlgrip HS or Awlcraft 2000 Topcoat and teak cleaners. Most teak cleaners contain acids or caustic agents that stain and discolor an Awlgrip, Awlgrip HS or Awlcraft 2000 Topcoat. 4. Do not use strong solvents (e.g. lacquer thinner, M.E.K., acetone) to clean Awlcraft 2000, Awlbrite Clear or Awlspar Varnish. 5. Do not allow wet equipment (e.g. seat cushions, coils of line, sails, sail covers, coolers) to trap and hold moisture against Awlgrip Topcoats. This condition can result in blistering or delamination of the Awlgrip, Awlgrip HS or Awlcraft 2000 Topcoat. 6. Do not use acrylic †Teflon® coatings over an Awlgrip, Awlgrip HS or Awlcraft 2000 Finish. Use of these coatings void the Awlgrip Limited Warranty. 7. Do not “shrink wrap” or tightly bind Awlgrip, Awlgrip HS or Awlcraft 2000 Topcoat surfaces with plastic wrappings. When tarping a boat for storage, the cover system should be ventilated to allow the coating system to “breathe”. Covers and tarps, whether synthetic or natural fiber, should not be pulled tight to surfaces painted with Awlgrip, Awlgrip HS or Awlcraft 2000 Topcoat. This condition can trap and hold moisture on the surface and may result in loss of gloss, blistering or delaminating of the topcoat. Caution should also be used to ensure that the tarp does not chafe against the Awlgrip, Awlgrip HS or Awlcraft 2000 surface. Such chafing, especially when accompanied by airborne dirt, can abrade the surface and cause premature loss of gloss.